Dance, music, and theater! Experience the performing arts of the Lynnwood, WA area. When you stay in Lynnwood, you’ll have easy access to amazing performing arts! The Pacific Northwest has a wide variety of live music, contemporary dance, comedy and unique Puget Sound area traditions, experience it all! Visit our events calendar to find a concert, play or comedy show during your stay in Lynnwood. The Black Box Theater, located on the Edmonds Community College campus, is an intimate venue for local performing arts, concerts, improv comedy and more. 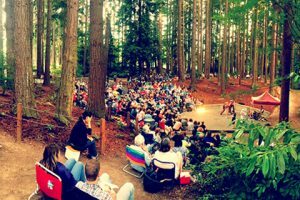 The Lynndale Park Amphitheater, located in Lynnwood’s Lynndale Park, hosts a variety of free cultural events including the popular Shakespear in the Park performances in the summer. Edmonds Center for the Arts presents a varied selection of performing artists from around the world including dance, music and theater. The Edmonds Driftwood Players are one of the oldest community theaters in Washington. The Main Stage offers five crowd-pleasing productions every season.